If you haven’t already noticed, there’s a fleet of new bikes around the city of Charleston that are ready to ride at a moment’s notice. 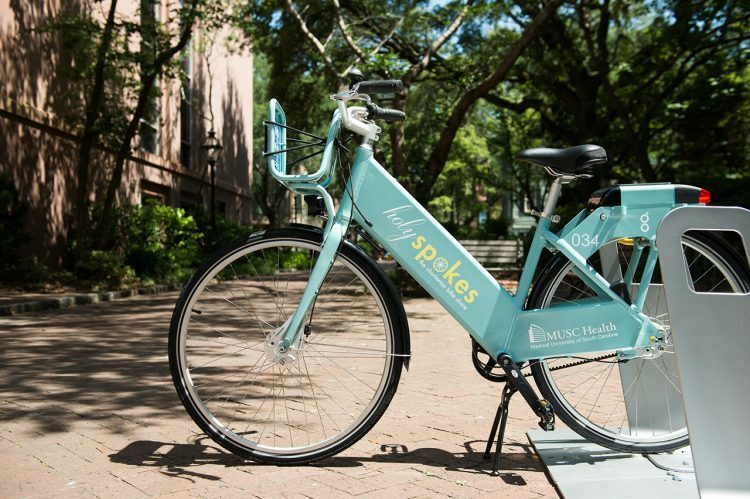 There are several bike share corrals on the College of Charleston campus, so let’s walk through the steps for taking out one of these cruisers. Step 1: Download the SoBi (Social Bicycle) app on your phone to sign up for an account with Gotcha Bike. Rates vary, but college students can rent bikes for $40 a year. Step 2: Once you’re in the system, locate a Holy Spokes bike close to you. Open the app and SoBi will find the nearest corral. Step 3: SoBi will tell you how many bikes are available and where to find them. Step 4: Input your SoBi account number and personal identification number associated with your account into the rear keypad located on the frame. The bike will unlock. Step 5: Unlock your two wheels, insert the yellow lock into the back of the frame, and you’re on your way. Step 6: Remember to wear a helmet, ride on the street (not sidewalks) and always follow the rules of traffic. Step 7: When finished with your ride, return your wheels to a Holy Spokes corral, lock it up up, and key into the back panel that you are done for the day. Step 8: The SoBi app will confirm that you have returned the bike for the day. Now, rest and repeat.